Since April 2015, I worked as a UN Volunteer Public Policy Specialist in the United Nations Entity for Gender Equality and the Empowerment of Women (UN WOMEN) country office in Quito. However, one day my responsibilities shifted in a totally unexpected way. UN Volunteer Jasmin Blessing (standing) interviews local women on women's participation in camp governance in the shelter of Pedernales. Pedernales, Ecuador: Since April 2015, I worked as a UN Volunteer Public Policy Specialist in the United Nations Entity for Gender Equality and the Empowerment of Women (UN WOMEN) country office in Quito. However, one day my responsibilities shifted in a totally unexpected way. On 16 April 2016, a 7.8 magnitude earthquake struck Ecuador´s coast, leaving 668 people dead, nearly 7000 houses destroyed, 151 buildings damaged, and more than 4,605 people injured. Around 720,000 people are in need of humanitarian aid, and almost 30,000 people have sought refuge in temporary camps. Following the earthquake, the situation of women and girls was of particular concern because they are more likely to become victims of various types of violence and/or discrimination in a humanitarian emergency. Displacement, over-crowed camps, lack of privacy, lack of lighting, limited and unsegregated wash facilities increase the risks. Furthermore, the area struck by the earthquake already experiences high rates of gender-based violence, teenage pregnancy and gender discrimination. UN Women strives to ensure that women are protected from gender-based violence, and that they participate in the humanitarian response to the disaster. I had the opportunity to mainstream gender in the various humanitarian projects that are being executed. On the one hand, I supported the training of the Ecuadorian Armed Forces (that are part of the peacekeeping programme) on protection in camps, and identification and prevention of gender-based sexual violence. Working with the military was fascinating and challenging since there are still many gender stereotypes in this traditionally male-dominated area of work. On the other hand, I had the opportunity to participate in a pilot project that aims to increase women’s participation in camp governance. Camps are very male-dominated places, where women are often excluded from decision-making in response strategies that affect their ability and that of their community to recover from crisis. 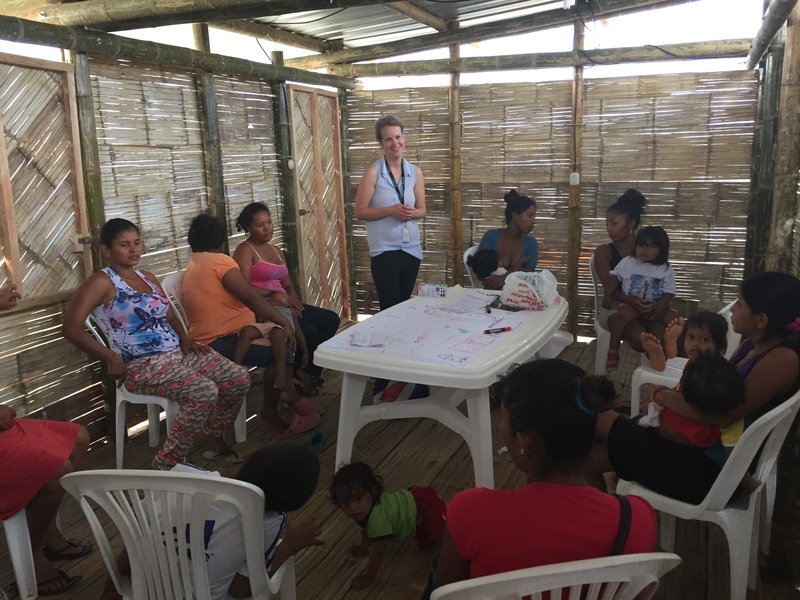 The project was conducted simultaneously in two camps in Pedernales, the city most affected by the earthquake, to identify the current status of women’s participation in camp governance structures, and their perception of safety. Ecuador is one of five countries where this project is being piloted. I interviewed local women residing in the camps, and was shocked to learn how deeply gender roles still prevail in the camps. After confirming this initial diagnosis, our next step in this project is to design evidence-based small projects that aim at changing traditional gender roles and improving women’s participation. I look forward to seeing how this project will directly benefit women living in the camps. Women survivors of the earthquake have already started to participate in non-traditional activities, such as cash-for-work initiatives and the removal of debris. I feel very grateful to be part of UN Women as a UN Volunteer and to be able to support the women and girls directly affected by the earthquake. Being a UN Volunteer gave me the opportunity to work with the population directly affected. My experience in Ecuador taught me that natural disasters can change household dynamics and promote opportunities for women as agents of change. Gender stereotypes can and have changed over time. They change fast in emergencies, and this is a challenge and an opportunity to build a more equal society.